Antonin Dvorak. Image created by Anna Cierocki. 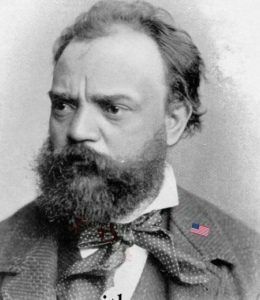 ESSEX — Dvorak was the first major European composer to take up residence in America. For nearly three years he was the director of the National Conservatory in New York City. Outside of his teaching duties he still found time to compose some of his finest music. On Monday, Nov. 6, at 1:30 p.m. at the Essex Library, Jeffrey Engel will detail Dvorak’s time in America and play excerpts from some of his American works. Engel is an adjunct professor at the University of Connecticut in Torrington, and also a music historian and orchestral cellist, who trained in Paris and Austria before returning to the U.S. to teach. He was selected as one of the 50 most influential people in Litchfield County, Conn. by Litchfield Magazine in 2010.